Agreement Resources, LLC provides mediation, consulting and training services to individuals, families, businesses and community groups. "Divorcing couples follow Gwyneth’s lead and ‘consciously uncouple’"
"Battling it out when it comes to aging parent's care? 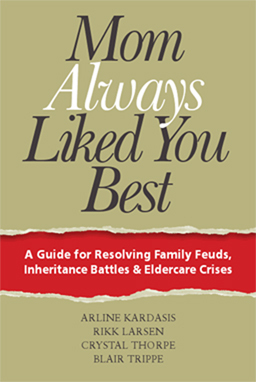 Elder mediation might help"
"Strengthening Troubled Sibling Bonds to Deal With an Aging Parent"
"The Ties that Blind: Elder Mediators Help Siblings Come To Peace for the Sake of Aging Parents"
"A Referee for Family Disputes"
"Mom Always Liked You Best: A Guide for Resolving Family Feuds, Inheritance Battles & Eldercare Crises"
"Oh, Brother! With Parents Aging, Squabbling Siblings Turn to Elder Mediation"
"The Caregivers: Sibling disputes over care"
Helping our clients settle their disputes without litigation since 2003. • Identify the decisions they need to make in order to navigate the divorce process. • Consider and discuss their interests and options. At Agreement Resources, LLC, we are sensitive to your wish for containing the costs associated with your divorce, while not sacrificing thoughtful decision-making. We customize our services to fit your needs. Some couples find they are able to do much of the decision-making related to their divorce on their own, and appreciate the opportunity to use mediation sessions that are focused on just one or a few specific issues that they are struggling with. Other couples especially value the safe, comfortable space that we create, and choose to discuss most of their decisions with the help of our mediators. Whatever your situation, we would be happy to talk with you to explore how we can best be of help, whether with traditional face-to-face divorce mediation, long-distance mediation options, or with our targeted divorce mediation services to support your online divorce process. Agreement Resources provides co-mediators, usually a male and a female, to help couples work through decisions related to divorce. The number of sessions depends on how much of the process you are able to do on your own. At the end of the process, our mediators provide you with a written Memorandum of Understanding (MOU) which documents the decisions you have made. This MOU serves as the blueprint for a Separation Agreement to be filed in court. We work with a number of mediation-friendly attorneys who can prepare the necessary final documents for you, as needed. Conventional wisdom holds that mediating a divorce between two people separated by distance and time zones is far from ideal. But modern technology offers choices that weren’t available until recently and can make all the difference in creating an alternative process in which a rich and effective mediation can occur. Video conferencing can be used effectively in mediation when face-to-face mediation isn’t feasible. For a detailed discussion of this long distance mediation option read "Online Divorce Mediation – making use of technology" by Agreement Resources co-founder Blair Trippe, in a recent issue of ACResolution, the magazine of The Association for Conflict Resolution. Some of our clients use online divorce services for a portion of their divorce process. Whether using forms provided online for free by the courts, or using fee-based online divorce services, couples can often complete much of the required divorce paperwork online in an efficient and timely manner. However, couples need to be in agreement about their divorce issues when they finalize their online divorce questionnaire. Whether it is one issue or several, sometimes couples need help resolving complicated or contentious matters. That’s where we can help. At Agreement Resources, LLC, we are sensitive to the need for cost containment and timely decision making and will customize our targeted decision making services to fit your needs. For issues related to elders, caregiving, trusts and estates, please visit the website of our elder mediation division, Elder Decisions, at www.ElderDecisions.com.